Have you got a great T-shirt idea but you don't know anything about printing? Are you looking for a printing process that you can do at home? Our handy little guide gives you the lowdown on each type of printing and which one will work best for your new business.Each method has it's own pros and cons and sometimes the method you should use depends on what outcome you expect. So let's delve in and find out which one will work for you! Screen printing is the most favoured method for printing T-shirts for many reasons; it's fast, easy and relatively low cost while producing good quality results. In fact, the printing part of the process is the fastest part as most of the work is taken up by setup, which means the higher the quantity, the cheaper the cost. Each design starts with a stencil. A stencil is needed for each colour used, which is why one-colour designs such as logos work so well with screen printing. The stencil is held in place on a mesh (or screen, hence the term screen printing) and using a squeegee the ink is pushed through the stencil, through the mesh and onto the garment underneath.Big companies use machines to move the squeegee but it is possible to do this by hand making this a popular process to print T-shirts at home. Some indie designers even make their own screens using nylon or another material that allows the ink to seep through. While the outcome of the design depends on how well you line up the stencils and the quality of the inks you use, this process generally produces good quality results and is what you would normally find on garments in high street stores, band merchandise and company uniforms. The downside to this process lies in the design. Once you start printing more than four or five colours, the ink piles up and can become hard and plasticky. Due to the process, designs can only be placed on an area the size of your screen at one time, so there are some limits to how much of the T-shirt you can print on. Finally, while the ink quality and finishing determines how long your design will last, the ink is lying on top of the garment and after a while it will fade or peel or crack. 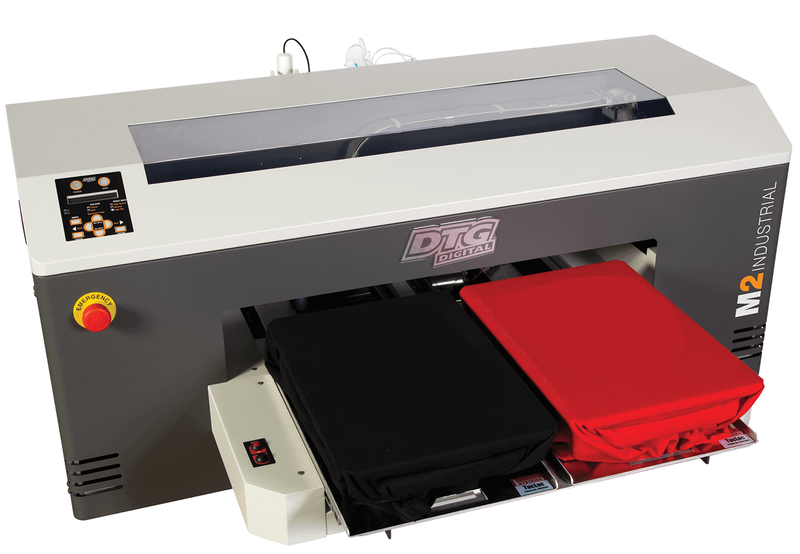 Direct to garment, sometimes known as digital printing is a process where a specialised ink-jet printer prints directly onto the T-shirt itself. While the printer itself is an expensive outlay, the opportunity to produce instant, one-off T-shirts is a valued method for companies creating custom or personalised designs to order. Although it sounds easy, there are some challenges with this technique when it comes to design. The printer works much better on lighter colours, particularly white T-shirts and the final result can appear a little dull or faded but if your design doesn't require bright colours then it may work for you. DTG produces a soft print which is of a good, but not excellent quality. Similar to screen printing, the design is limited to the area that the printer can print on and the whole process can be quite slow. For this process, a CAD plotter machine cuts out the shapes of the design in vinyl and then these shapes can be applied to the garment using a heat press. Have you ever seen a logo on a T-shirt which looks shiny and plastic? That's been made using CAD, and the process is excellent for cutting out different bright colours and layering them to create colourful designs. However the stiff plastic vinyl doesn't work as well on big designs. Both the software and hardware of this method can take some time to master, but once you do it is fast to use and the vinyl is thick enough to last a long time without fading. With this method, the design is printed onto transfer paper and applied to the garment using a heat and pressure press. Because the design is printed as a whole, it can be a little more detailed than the other methods mentioned above and it's simple enough to grasp almost immediately. Of course, one cheap way to apply the transfer paper is a household iron! Making this one of the cheapest options available. The downsides however, are that the result isn't quite as bright as other printing methods and the transfer itself can peel off over time. Fabrics that react with heat cannot be printed on, and sometimes it is possible to see the outline of the transfer paper even when there is no design printed on it. Using special inks that change their state from liquid to gas, sublimation is a complicated and expensive process that secures the ink particles inside the fabric itself to create a brightly coloured print that never cracks or fades over time. This process is what we use on our own products mainly because it is the only way to create all-over prints. If you can sacrifice price, you can create whole works of art across the whole of a garment. The biggest problem with sublimation is the restriction on fabrics that can be used, cotton and other materials don't hold the ink well and can look faded or dull. So there you have it. Now you know the ins and out of each printing technique, which one will you use?